The Shop Fox W1713 is an electric scroll saw that has an inbuilt 60Hz motor and a voltage power of 110 volts. The features that make this saw stand out are variable speed control, additional cutting potential, and a cast iron body. The saw comes with a dust blower and port, gooseneck work light, along with a big 45-degree tilt table and easily swappable blades. 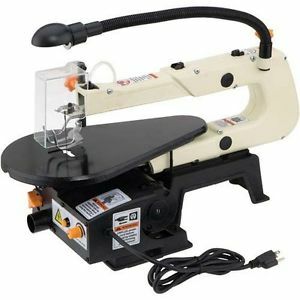 In this Shop Fox scroll saw review, we’ll look at some of the positives and negatives of this scroll saw and find out what makes it one of the most popular scroll saws in its category. For someone who has never used scroll saws before, this is the ideal machine to start with, thanks to the easy-to-read and understand user manual, easily swappable blades, etc. The saw doesn’t vibrate much when used. In fact, it manages to stay steady even when not bolted to a work bench. In this price category, no other saw comes with a cast iron table. The majority are either made from sheet metal or aluminum. Iron is much more robust than aluminum or steel. The adapter that comes in the package for pinless blades isn’t the smoothest of implementations. It’s clunky to use even after getting accustomed to it. The two blades that come packed in with the saw aren’t the best around. They may do their job but you would be more satisfied with a third-party blade. Fortunately, the W1713 works equally well with other manufacturer blades. The scroll saw has limited usage capabilities. If you’re a professional, you could feel a bit restricted with this machine, depending on what your woodworking requirements are. • Can this machine use twist or round blades? Yes, and if you’re not sure, you may confirm this with the Shop Fox technical support team. • What thickness can this saw cut at most? This actually depends on the wood type, feed speed, and blade. With certain wood types, even a 1 inch cut would be a tough proposition. Softer woods can be easily cut up to 1 ½ inches. It’s therefore safe to say the maximum thickness that can be cut is 2 inches. • Are blades part of the package? Yes, they are. In fact, you get two blades with the item package. There are also adapters to embrace plain end blades, in case you opt to buy the blades yourself. • Does the saw come with a stand? No, there’s no stand in the package. You’ll have to buy it separately. • Is the saw quiet when at work? Active saws are seldom quiet. However, when compared to most power saws, this saw is noticeably quieter. The actual noise made by the saw varies with the speed at which it’s working. This Shop Fox scroll saw is targeted at entry-level and mid-range users. It, therefore, packs in all the power, features, and flexibility a casual saw user would need. And for the price, it certainly does offer a lot more than expected. Professional woodworkers may use this device to supplement their more powerful scroll saws.